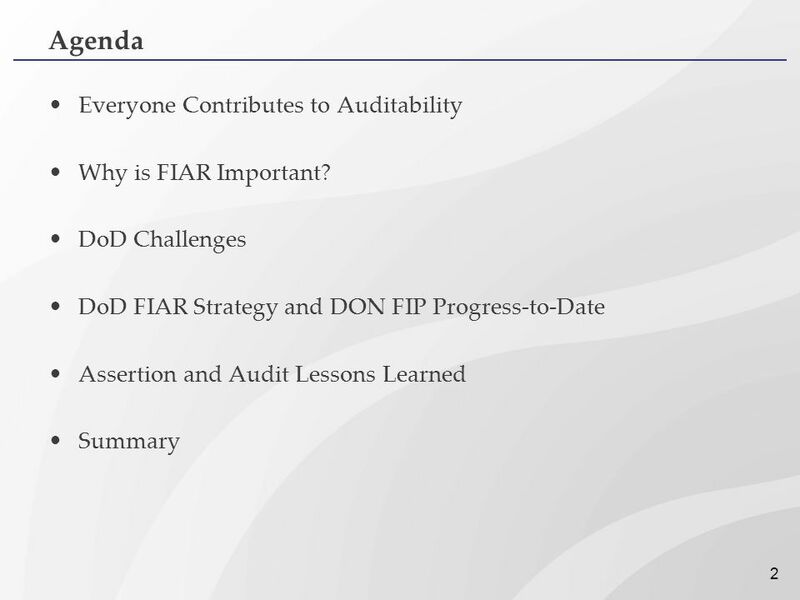 2 Agenda Everyone Contributes to Auditability Why is FIAR Important? 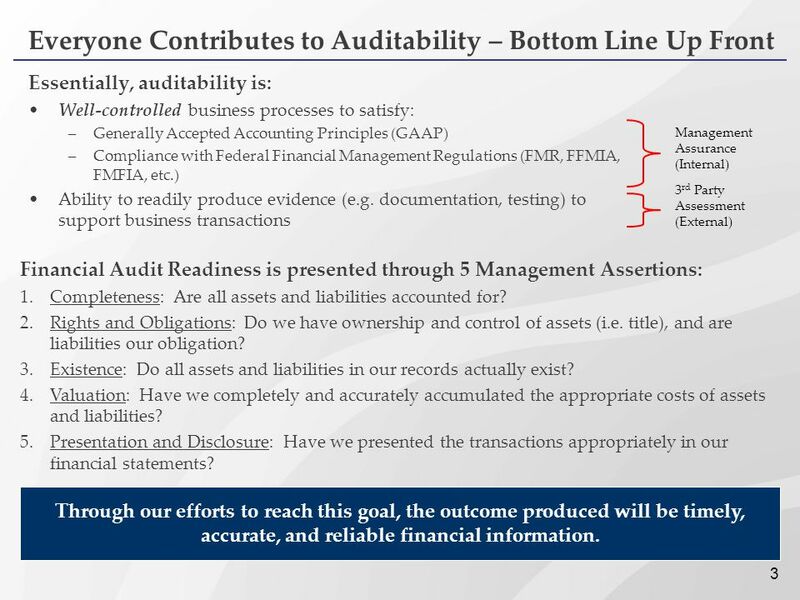 Essentially, auditability is: Well-controlled business processes to satisfy: Generally Accepted Accounting Principles (GAAP) Compliance with Federal Financial Management Regulations (FMR, FFMIA, FMFIA, etc.) Ability to readily produce evidence (e.g. 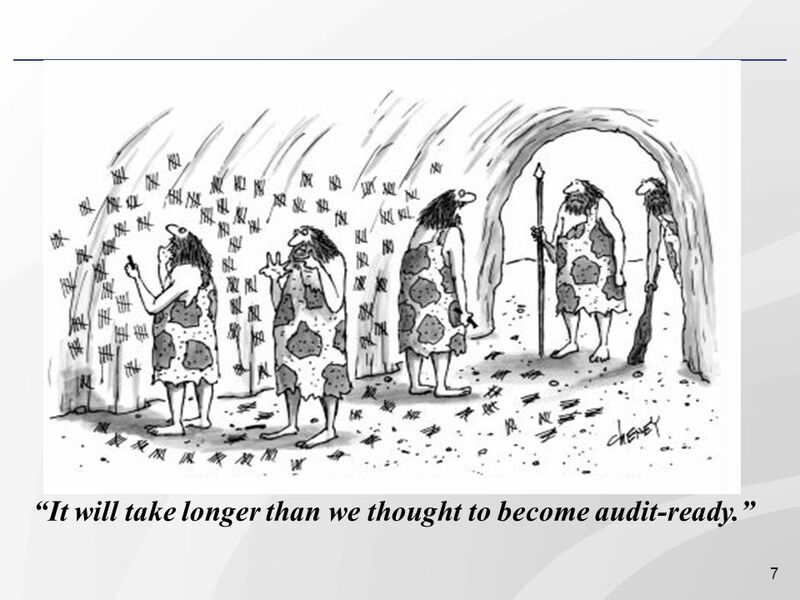 documentation, testing) to support business transactions Management Assurance (Internal) 3rd Party Assessment (External) Financial Audit Readiness is presented through 5 Management Assertions: Completeness: Are all assets and liabilities accounted for? Rights and Obligations: Do we have ownership and control of assets (i.e. title), and are liabilities our obligation? Existence: Do all assets and liabilities in our records actually exist? Valuation: Have we completely and accurately accumulated the appropriate costs of assets and liabilities? 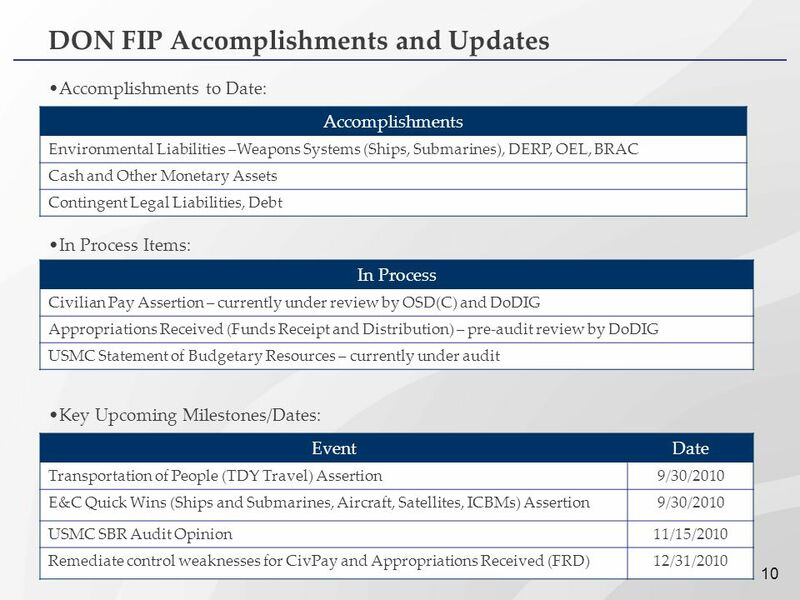 Presentation and Disclosure: Have we presented the transactions appropriately in our financial statements? 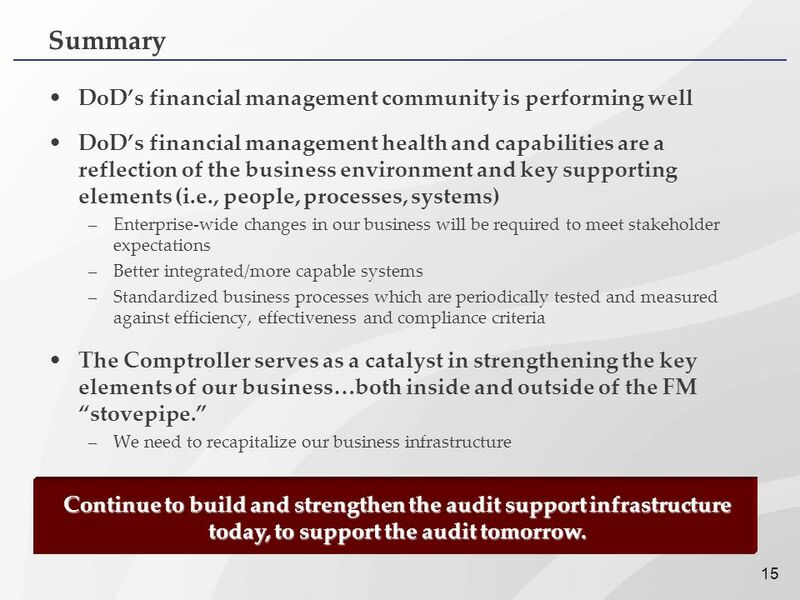 Through our efforts to reach this goal, the outcome produced will be timely, accurate, and reliable financial information. 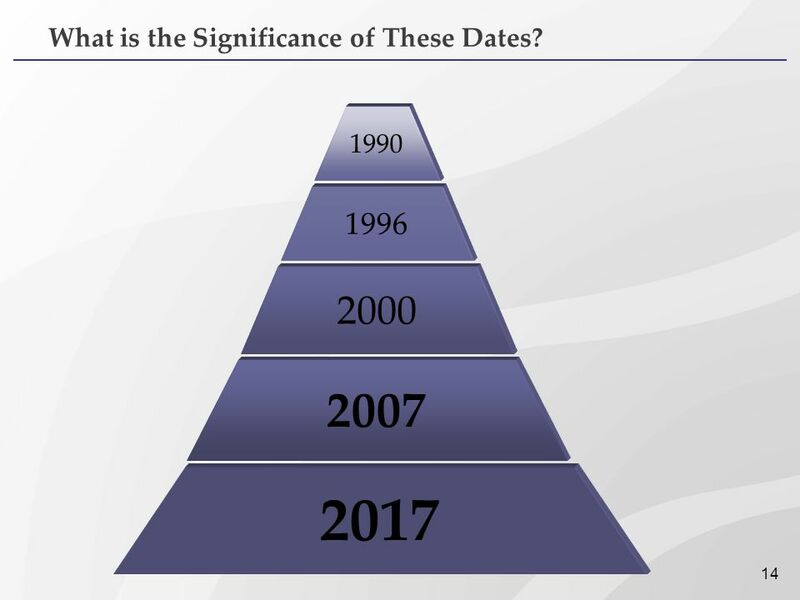 14 What is the Significance of These Dates? 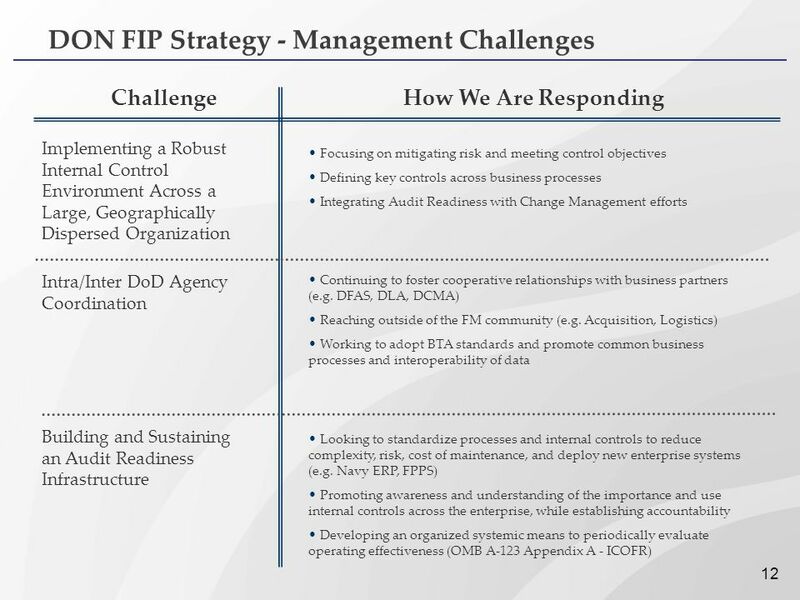 DoD’s financial management health and capabilities are a reflection of the business environment and key supporting elements (i.e., people, processes, systems) Enterprise-wide changes in our business will be required to meet stakeholder expectations Better integrated/more capable systems Standardized business processes which are periodically tested and measured against efficiency, effectiveness and compliance criteria The Comptroller serves as a catalyst in strengthening the key elements of our business…both inside and outside of the FM “stovepipe.” We need to recapitalize our business infrastructure Continue to build and strengthen the audit support infrastructure today, to support the audit tomorrow. 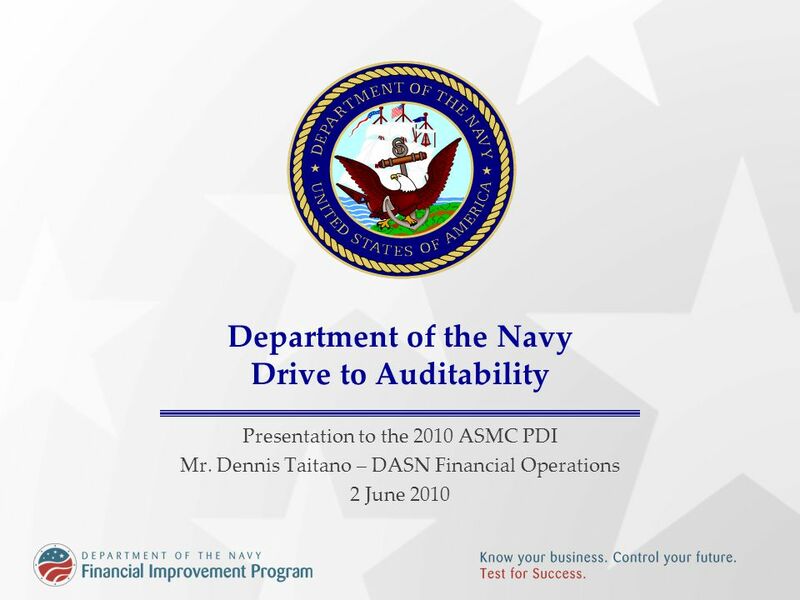 Download ppt "Department of the Navy Drive to Auditability"
Service Provider Support of Audit Readiness Office of the Under Secretary of Defense (Comptroller) March 14, 2011. 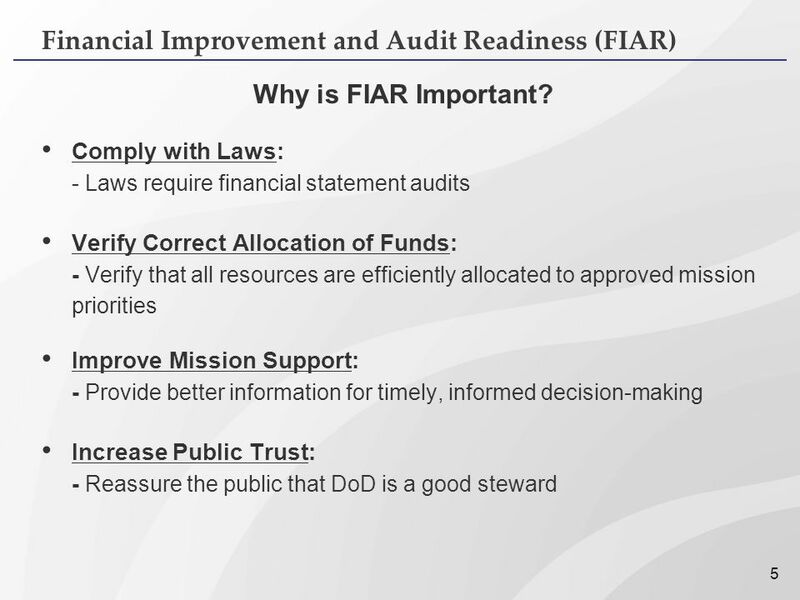 Financial Improvement and Audit Readiness (FIAR) Office of the Under Secretary of Defense (Comptroller) Inventory and OM&S Audit Readiness Status October. 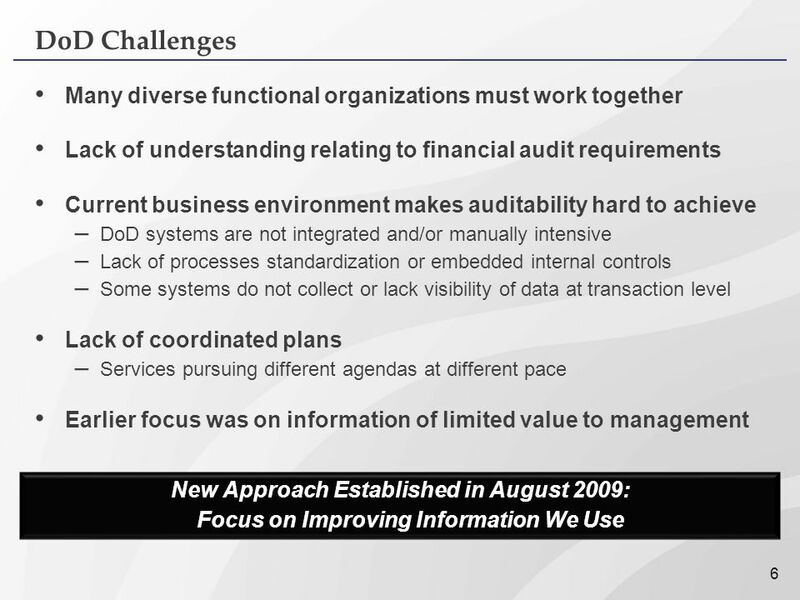 Internal Controls 101 RDML K. Taylor | DHS CFO Brief | 25 JAN 2010 Assistant Commandant For Resources. 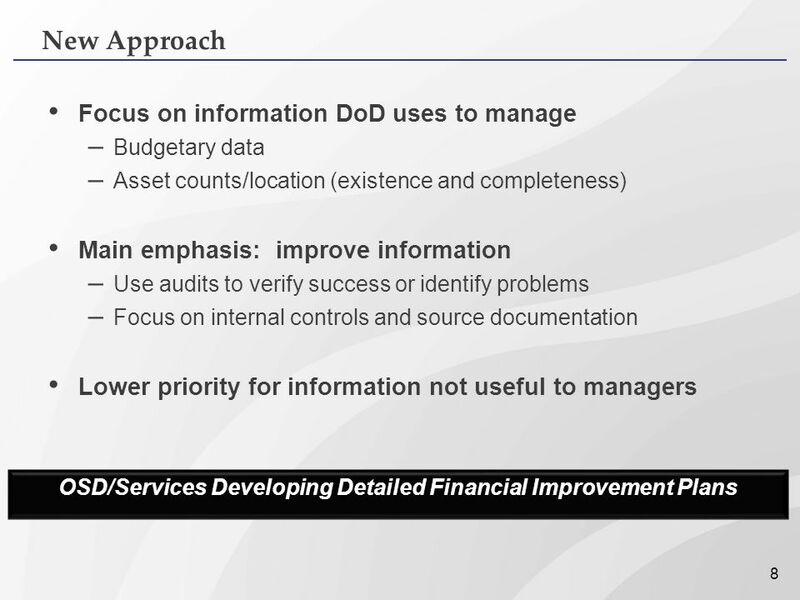 Department of Defense Building a Better Financial Management Foundation with Standardization James E. Short Deputy Chief Financial Officer March 11, 2008. 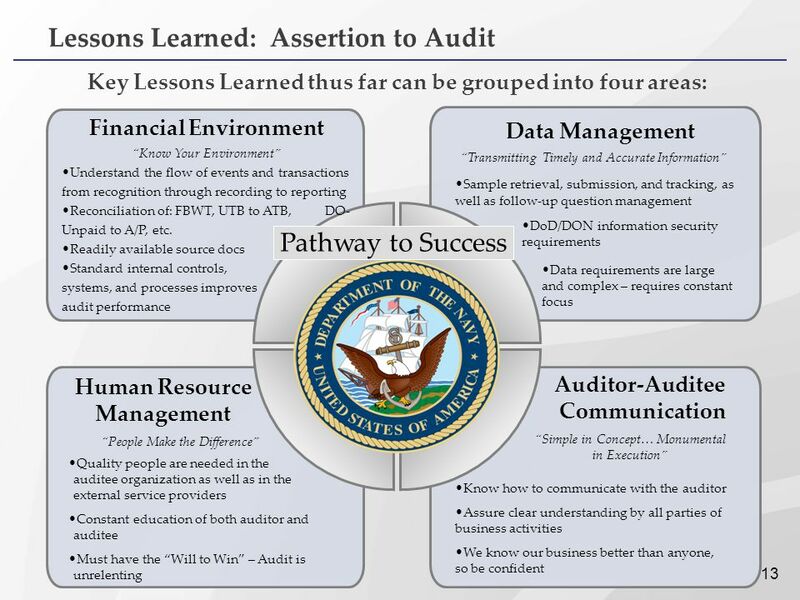 “Going to Audit” Presented To: Navy/Marine Corps Service Day Workshop American Society of Military Comptrollers (ASMC) Professional Development Institute. I NSPECTOR G ENERAL U.S. Department of Defense INTEGRITY  EFFICIENCY  ACCOUNTABILITY  EXCELLENCE 2014 INSPECTOR GENERAL MARINE CORPS TRAINING SYMPOSIUM. 9 th Annual Public Health Finance Roundtable November 3, 2012 Boston, MA Peggy Honoré. 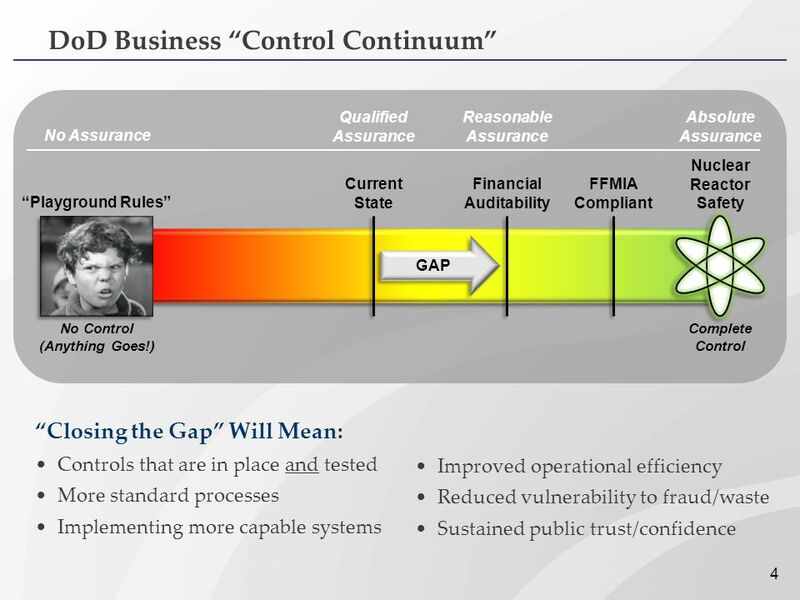 Integrity - Service - Innovation Enterprise Risk Management for the Federal Government – Where’s the Value? Donna Davis Defense Finance and Accounting. 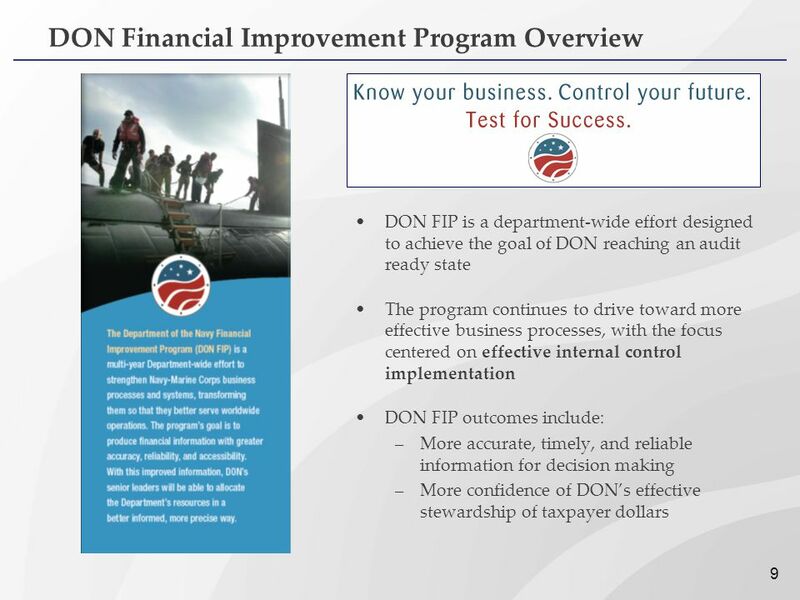 DEPARTMENT OF THE NAVY Financial Improvement Program FIP Strategy Update DON Standardization Pilot 2 June 2010. 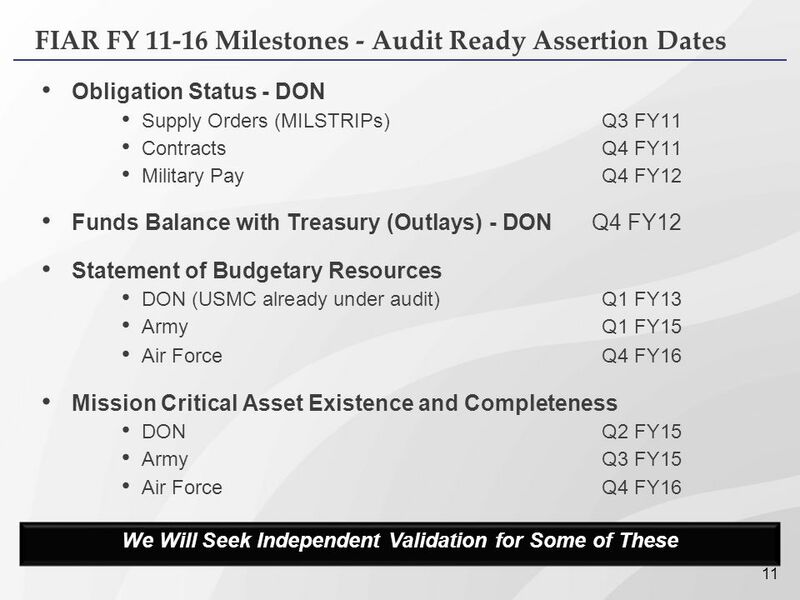 UNCLASSIFIED / FOR OFFICIAL USE ONLY USAFMCOM UNCLASSIFIED / FOR OFFICIAL USE ONLY.